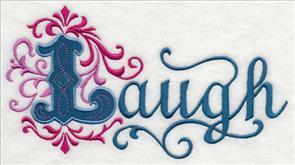 At Embroidery Library, we love requests. We adore your emails describing designs that you want to see! Every week we create one new design based on a special request. And when our inbox overflows with excellent ideas, we have a "request-fest" where ALL the new designs are based on customer requests and ideas! A request-fest design week always results in a colorful display of ideas, and a gorgeous variety of subjects and styles. 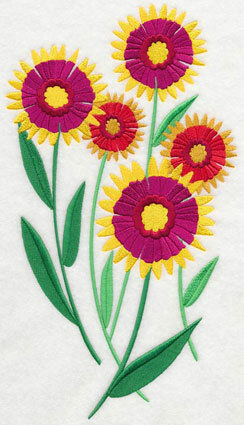 Scroll down the page to see these stunning new designs, and enjoy adding them to your projects! Enjoy this request-fest, and beautiful new designs! 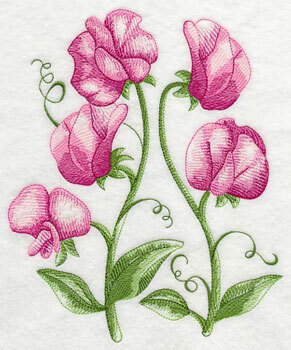 Sue was looking for sweet pea flowers to brighten up her home. These flowers are native to southern Italy, and the fragrance tends to sweep us away to thoughts of a Mediterranean holiday. 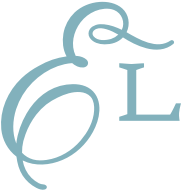 The designs are drawn and digitized in a light-and-lively style. They're an excellent choice for smooth, neutral fabrics, like quilter's cotton, linen, and tea towels. Sweet peas come in a variety of colors, so experiment with different thread choices to match your home decor and personal preference. 6.90" x 8.86" and 5.83" x 7.49"
6.52" x 7.80" and 5.85" x 6.98"
4.85" x 5.80" and 3.22" x 3.85"
A border of colorful sweet pea blossoms is stunning on quilts, placemats, and table runners. It's also lovely on the hems of skirts, dresses, and shirts. 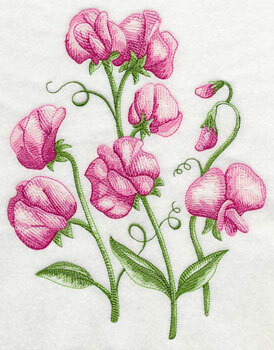 11.75" x 4.59" and 9.40" x 3.68" and 7.80" x 3.05" and 6.00" x 2.50" and 3.85" x 1.50"
Add delicate sprigs of sweet peas to napkins and pockets! The designs are light with open areas, and they're a perfect fit for quilter's cotton, linen, and other smooth, neutral fabrics. 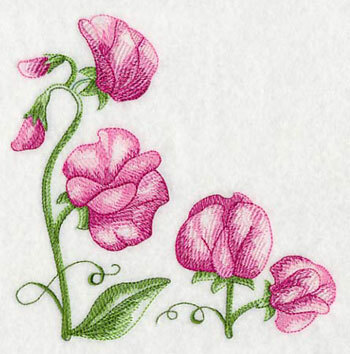 5.87" x 5.86" and 4.86" x 4.86" and 3.86" x 3.86"
Add a beautiful spring look to your table linens, quilts, skirts, and shirts, with this delicate sweet pea designs! They are light and open, making them easy-breezy additions to spring and summer garments and decor. Order the designs singly by using the links above, or get them all in a design pack! 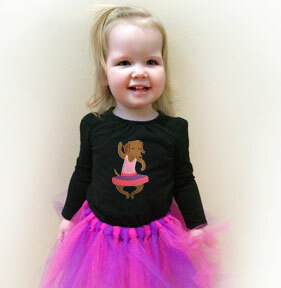 Ann from Australia wrote to chide us for our "amazing lack of ballet represented in your huge collection of designs." 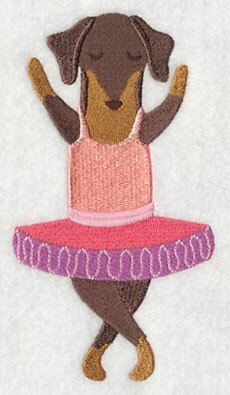 She added that in Australia ballet is "almost a rite of passage for young girls, no matter how clumsy the child." 3.15" x 5.18" and 1.95" x 3.21"
These designs are filled with a dancer's grace, and extraordinary energy. 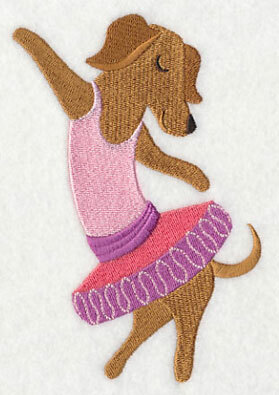 They will plie and jete their way onto your embroidery projects! 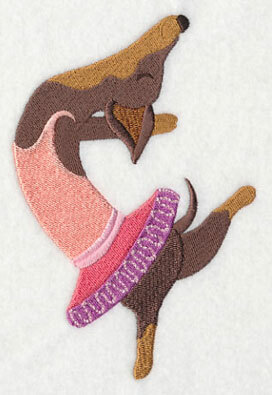 Add them to tote bags, pillows, and shirts for your sweet little dancers. 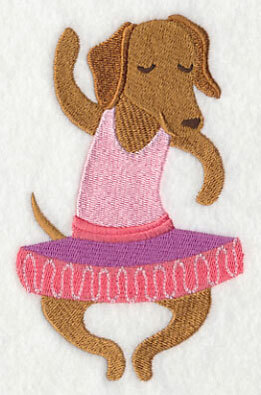 Sweet little dachshunds are dolled up in their finest tutus, and reveling in their dance! 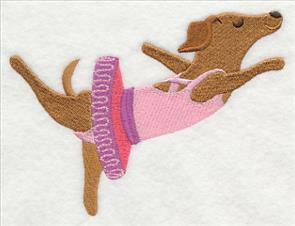 Delightful on quilt blocks, dance totes, pillow covers, and more. 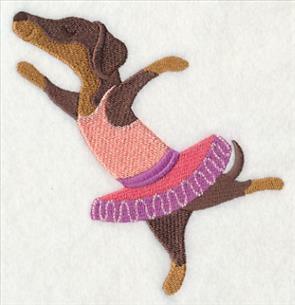 4.01" x 5.98" and 2.49" x 3.70"
Arabesque and Grande Arabesque poses are stunning finales for these graceful, talented dachshunds. 4.91" x 5.06" and 3.04" x 3.14"
get a whole pack of "balleweiners!" Stitch the troupe onto quilts, pillows, bags, and more. 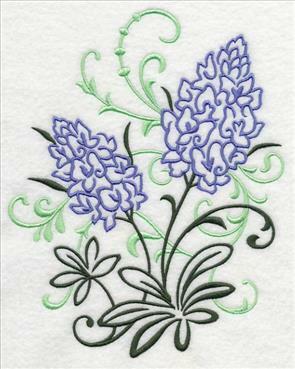 Danae loves bluebonnets and Queen Anne's lace, and requested colorful firewheels. She wrote, "Let's make Lady Bird proud. Texas wildflowers are awesome!" 6.56" x 11.71" and 5.27" x 9.41"
6.88" x 11.30" and 5.72" x 9.41"
4.76" x 7.81" and 4.19" x 6.88"
These designs will brighten up any of your embroidery projects. 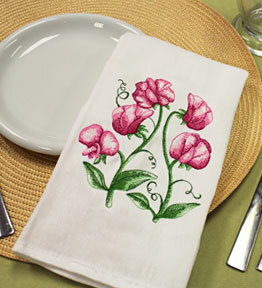 Add them to placemats and table runners, and let them grow from mini-quilts and bath towels. 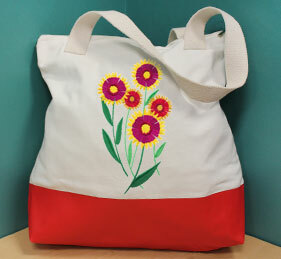 Stitch them onto tote bags for the farmers market and grocery store! Let your creativity bloom and grow with these beautiful new designs. Firewheels are also called Indian blanket, or sundance. 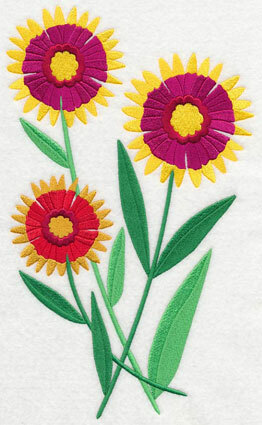 The centers are rich red and violet, and the tips of the petals are bright yellow sunbeams. 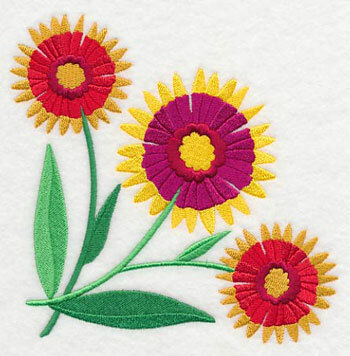 Stitch these designs onto table linens, and brighten up bath towel sets! 11.72" x 3.36" and 9.40" x 2.70" and 7.82" x 2.25" and 5.98" x 1.93" and 3.89" x 1.13"
Add colorful firewheels to pockets, corners of placemats, napkins, washcloths, and more! 5.87" x 5.85" and 4.85" x 4.83" and 3.89" x 3.87"
Pick your favorite flowers by using the links above, or get the whole bouquet in a design pack! Linda loves the filigree flowers. 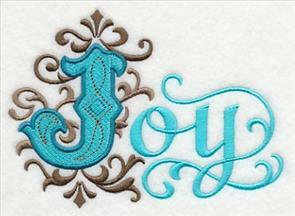 They're elegant and graceful with the whirls and swirls of stitches! 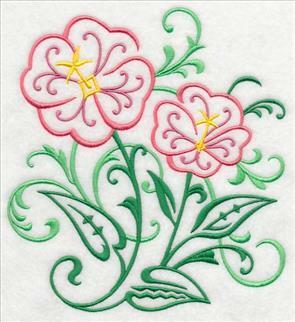 She's from Texas and wrote to request a Pink Evening Primrose and Bluebonnets in the special filigree style. We are happy to oblige! 6.85" x 7.40" and 5.86" x 6.33"
6.85" x 8.52" and 5.86" x 7.29"
4.86" x 6.04" and 3.12" x 3.87"
Lynn from Florida enjoys using the illuminated inspiration designs, and has embroidered them on fleece blankets for friends and family. She writes, "People just love the message when they are presented one." She asked for more words, such as Peace, Joy, Goodness, Laugh, Friend, Strength, and Kindness. We were happy to oblige, and added a few others, too. 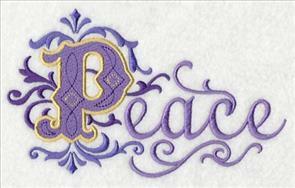 5.35" x 3.81" and 4.43" x 3.16" and 3.15" x 2.24"
We experimented with several color schemes when embroidering these designs. A chocolate and turquoise color scheme is fashionable and on trend, while purple and yellow is a classic choice. 9.60" x 3.94" and 7.95" x 3.26" and 5.64" x 2.31"
Try different color combinations to find one that you like best! Choose hues to match your home decor and personal preference. 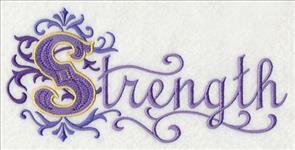 10.63" x 4.32" and 8.80" x 3.58" and 6.24" x 2.54"
Courage and gratitude are beautiful messages stitched onto fleece blankets, linen tea towels, terrycloth bath towels, and bolster pillows. Use one piece of cutaway stabilizer on the back of the fabric to get excellent results. 9.23" x 4.09" and 7.65" x 3.39" and 5.42" x 2.40"
Illuminated inspiration designs are inspired by old manuscripts, where the first letter of a chapter had extraordinary decoration. 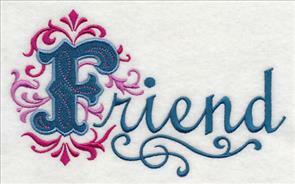 Designs in this style bring a classic and artful look to embroidery projects. 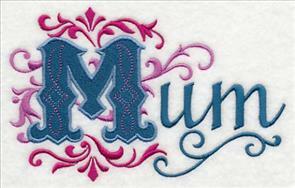 6.85" x 4.14" and 5.67" x 3.43" and 4.02" x 2.43"
Stitch "Mother" or "Mum" onto blankets, bags, and towel sets, for Mother's Day! 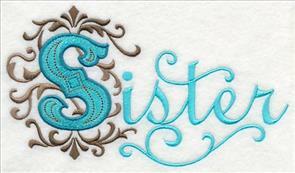 6.21" x 3.85" and 5.14" x 3.18" and 3.65" x 2.25"
Grandmother and sister will adore projects embroidered with their loving titles. 7.06" x 4.01" and 5.85" x 3.32" and 4.15" x 2.35"
Charlotte wrote "I love the clothesline designs!" She suggested that we design clothesline designs for tennis players, and well, that was an idea that we fell in "love" with. Game, set, and match Charlotte, your idea is a winner! 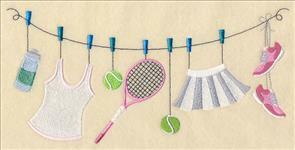 9.41" x 4.37" and 7.81" x 3.63" and 6.87" x 3.19"
These clothesline feature rackets, balls, and men and women tennis outfits. They're fun additions to towels for the athletes! 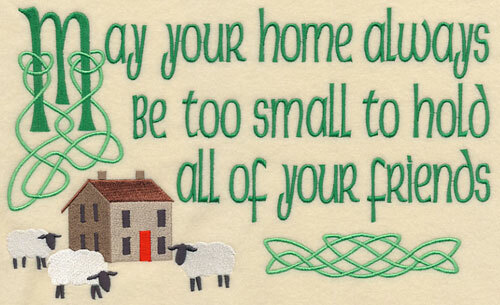 9.40" x 4.54" and 7.80" x 3.77" and 6.87" x 3.33"
Betty, Kay, and Susan all have a bit of Irish in them, and enjoy the many blessings that are rooted in the culture. 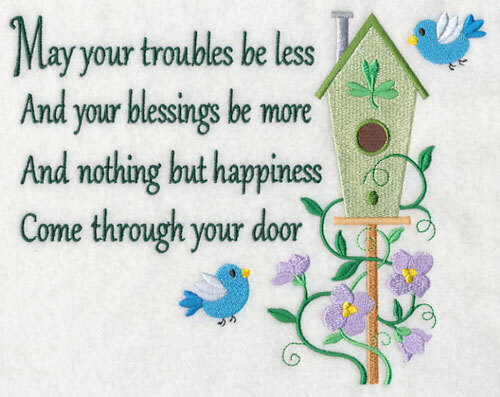 This design features a popular Irish quote with sweet little bluebirds. 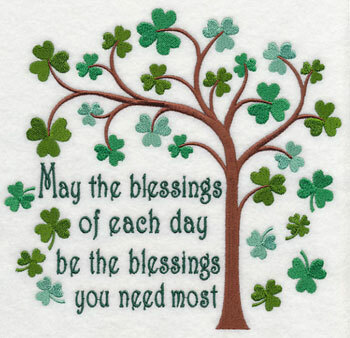 8.72" x 6.85" and 7.45" x 5.85" and 6.18" x 4.85"
A tree features shamrock-shaped leaves, embracing an Irish quote. Beautiful in a framed piece, or on a pillow! 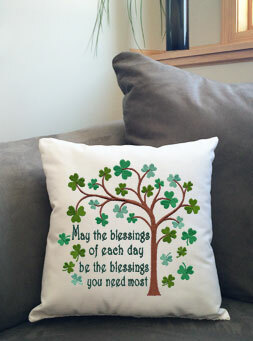 7.83" x 7.38" and 7.26" x 6.85"
6.20" x 5.85" and 5.14" x 4.85"
Irish blessings are beautiful on pillows, totes, quilt blocks, and framed pieces, too. Elegant Irish knotwork meets the primitive style in this design. The simplicity of a saltbox house is well-paired with the meaning of the words. 11.45" x 6.85" and 9.41" x 5.63" and 7.83" x 4.68" and 6.85" x 4.10"
Mary Pat has been stitching up a storm of projects using the dress form designs, and she asked for more! She writes, "I have made the Halloween one and the Mrs. Claus one. Can you do any other seasons? They are so cute!" Yes ma'am, we sure can! 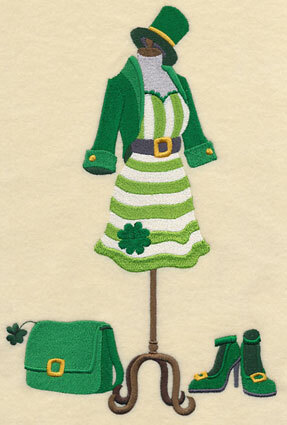 Two new ones are shown below - one for Irish dancing, and another for St. Patrick's Day. 4.45" x 9.49" and 3.82" x 8.14"
6.90" x 10.31" and 5.85" x 8.74"
5.23" x 7.80" and 4.59" x 6.86"